The Patient Protection and Affordable Care Act was signed by the President on March 23, 2010. This act establishes a national voluntary insurance program, the CLASS Independence Benefit Plan, to provide community living assistance services and supports to working individuals who have functional limitations and require ongoing assistance in the community. Individuals would pay a premium to participate in the program, and these premiums must be set to assure actuarial solvency for a 75 year period. Because the program is designed to serve working people regardless of functional status at enrollment, the pool of participants is likely to be comprised of a high proportion of employed individuals with disabilities for whom the insurance would be a particularly attractive benefit. Another group who would find the program attractive would be those who have sought to purchase private long-term care (LTC) insurance but been precluded from doing so because of their health status. Current estimates are that slightly less than 20% of all applicants for private LTC insurance are not able to buy policies due to their health status. 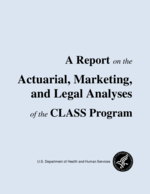 A key assumption underlying the development of actuarially fair premiums is that the risk profile of people enrolling in the program matches the profile that has been priced for; put another way, in developing premiums, the Secretary will need to take into account the fact that the population enrolling in CLASS will look very different from a cross-section of the population, or from individuals who enroll in other voluntary insurance programs, like private LTC insurance. This is because in the insurance market, companies are able to underwrite “bad risks” out of the risk pool at the time of application whereas the government will not have the ability to do so. Therefore, obtaining a profile of likely early enrollees and providing descriptive information to inform projections is particularly important for policymakers. Describe in general terms underwriting practices in the LTC insurance industry. Understand the relationship between age, gender, marital status and the reasons for decline in order to identify how underwriting declination distributions look for individuals in these various sub-groups. Compare the profile of individuals not able to purchase LTC insurance due to health reasons to new purchasers in terms of age, gender and marital status. Currently, there is no aggregate industry-wide knowledge about the population of individuals who have applied for LTC insurance but not been able to purchase policies due to health status. Thus, the study makes an important contribution to the knowledge base. Second, obtaining a profile of these individuals would provide important insight into likely CLASS participants. These are individuals who have actively sought to protect themselves against catastrophic LTC costs through an insurance mechanism but have not been able to avail themselves of private alternatives. Given that they understand the risk, they are likely to be among the first to enroll in the CLASS program. Third and closely related, the information provided herein should assist the Department in modeling what early program participants may look like so that there is a more informed basis for setting premiums to assure program solvency. Finally, obtaining a profile of these individuals may also assist in the development of customized benefit eligibility tools for specialized populations that are not typically served by the private long-term care insurance market. These companies accounted for roughly 70% of all new sales over the study period. In total, these companies contributed a sample of 55,070 individuals who applied for LTC insurance and did not pass the medical underwriting screens used by the companies. This data was also supplemented with contextual information derived from a survey of 21 private LTC insurers focused on their underwriting practices. The study, entitled “Results of the Long-Term Care Underwriting Survey for the Individual Market in 2009” summarizes in detail the way in which companies conduct the business of underwriting. Table 1 arrays the data elements according to the number of valid cases in the data file. Companies vary in the extent to which they capture all of the data that they actually use in the underwriting decision making process. What is common across all companies however is that information on medical diagnoses is captured. For that reason, while we have some level of detail on all 55,070 individuals, not all information is uniform. Some of the analyses will exclude large numbers of individuals. Even so, given the size of the sample, the smallest cells still contain over 18,000 observations. Because companies do not use conventional standards for summarizing diagnostic information, clinical underwriting staff at LifePlans reviewed all of the cases to assure that appropriate and broad diagnostic categories could be used to characterize the entire sample. In the analyses that follow, thirteen broad diagnostic categories are used, thus ensuring consistency across the entire sample. Information from this analysis has clearly demonstrated that individuals who are unable to purchase private LTC insurance due to the medical underwriting process tend to be somewhat older, male and less likely to be employed than the total applicant pool. While few exhibit outward signs of functional impairment or dementia, this is likely the result of agents pre-screening activities. Thus, the pool of applicant declinations is more representative of individuals who are at risk for near term need rather than immediate need. For that reason, the roughly 8% of individuals who are declined for not passing a cognitive screen are likely at the early stages of cognitive decline and for the most part do not have dementia at the time of application. The distribution of the sample by medical diagnosis suggests that there are a variety of reasons why someone may not be accepted into the risk pool. No single diagnostic category accounts for more than 15% of the declinations and there are clear patterns across age, gender and employment status. Estimating the prevalence of these diagnoses in the general target population for the CLASS Program is an important next step, as it will enable policymakers to begin to characterize with more precision the risk profile of enrollees. As such, this will enable more accurate pricing so that the premiums adequately reflect underlying risk and support ongoing program financial solvency. Results of the Long-Term Care Underwriting Survey for the Individual Market in 2009. LifePlans, Inc. Waltham, MA November, 2010. Note that in roughly 8% of the cases individuals are still declined based solely on information found in the application alone. This suggests that agent pre-screening is not always effective.